This month's Visiting Teaching message is "The Attributes of Jesus Christ: Without Sin." Already, my idea of striving each month to work on these specific attributes is foiled! I'm not going to be without sin, no matter how hard I try! But after reading the message and thinking about it extensively, it is something I can definitely strive for in my life. 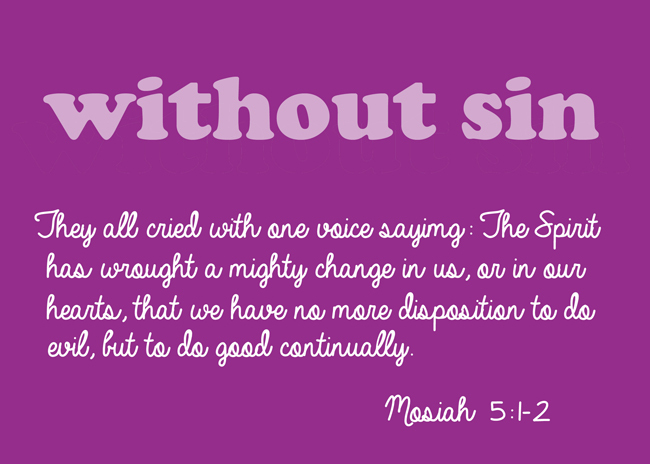 I may never be perfect, but there is repentance and a desire to be without sin--just like King Benjamin's people. I love the mighty change of heart that they undergo and that they have no more desire to do evil, but to do good continually. So my little "attribute card" for this month highlights that scripture. To download this printable, click here: February 2015 Visiting Teaching Printable.